mural wall painting and the ArtWorks festival. Centennial's Urban Art Crew is a group of graffiti artists and other artists (with a unique artistic style) that are into urban art (it's more than just graffiti) . They paint murals and canvases. They get to work with a professional artist. 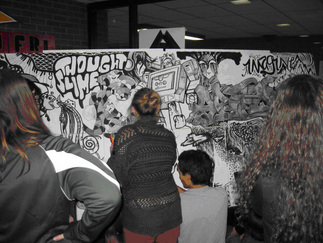 ArtWorks Festival promotes careers in all Art disciplines to senior students (especially grade 10). Students get to interact with professional artists through workshops (Dancers, actors, painters, DJ's, etc.). 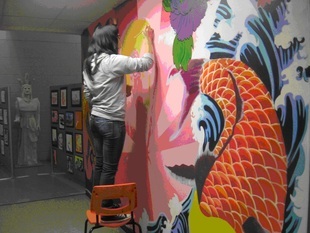 "Color Me Happy" is CRHS art club; selected artists get together to work on various art projects (murals, cards, posters, etc).